Help us to spread the word about our new communication channels. You can help us with public awareness and promoting the sport by following our social media sites or inviting your friends. To stay up to date with AOA news, events and receive some interesting, relevant information please connect with us. If you have any feedback or comments please share it with emailing us. World Orienteering Day: May 24. These great events will be delivered by the local clubs with AOA support. Stay tuned for your club news. 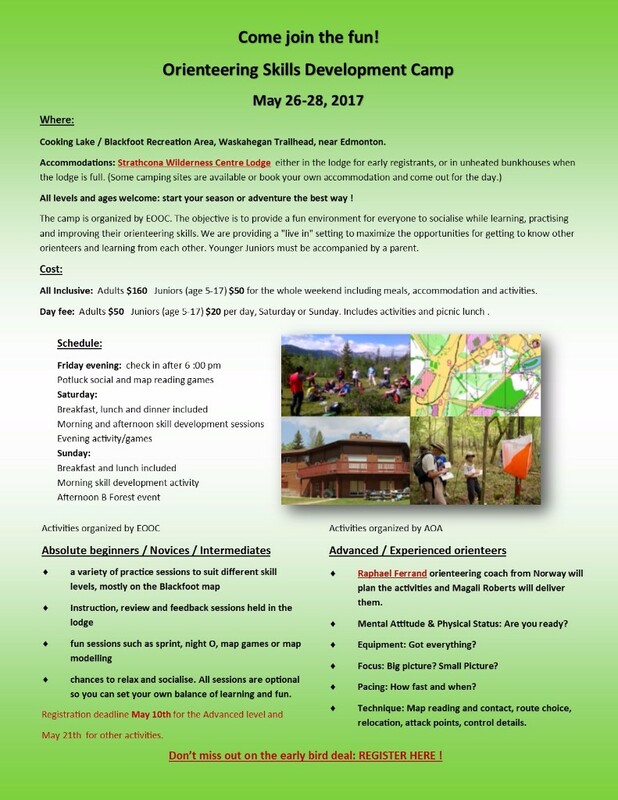 EOOC & AOA Skill Camp: May 26 -28, at Strathcona Wilderness Centre, near Edmonton. Everyone is invited to join the event, learn, practice and have fun. For more details see the flyer below or visit the EOOC website. NCCP Coaching Certification: June 10, Calgary (Analyze Performance and Support the Competitive Experience). For everyone who has experience and would like to get involved with coaching orienteering. Please REGISTER ASAP on our website before May 10, 2017. Everyone, including newcomers, are welcome to any of the EOOC events listed. There will be a beginners’ clinic and a beginners’ course at every event, except as noted. Come dressed for the weather. There is no need to let us know you are coming (unless you are bringing a group of 8 or more) – Just pick an event and turn up! For first time beginners we offer an Intro to Orienteering clinic, an active 90 minute taste of the sport. Once you have this under your belt, continue with the Navigation 101 course. First Annual Easter Sprint Relay Peep-tacular! : on Easter Sunday, we've decided to run a last-minute Easter relay event instead. Yes, there will be chocolate eggs. Details here. 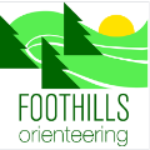 Young Orienteers Wanted! For many years, the Sass Peepre Junior Development Committee has organized an annual training camp for juniors from across Canada. Junior athletes of all abilities from 11 to 20 years of age are invited to participate in the 3 day camp, which always has amazing volunteer coaches coming from the ranks of the Senior National Team, High Performance Programme athletes, ex-national team members, and parents wanting to help their kids. For more information visits:Orienteering Canada website.